Red drum or redfish are the most popular species targeted on the saltwater flats of Central Florida. As members of the drum family, redfish on the Mosquito Lagoon and Indian River Lagoon system can range in length from twelve to fifty inched and weigh as forty-five pounds. Redfish are a year round species and are one of the most sought after targets when sight fishing the shallow flats. Redfish typically grow up in the estuaries and relocate to the ocean once sexually mature, but in both the Mosquito Lagoon and North Indian River Lagoons, the salinity levels are ideal for spawning, so some many redfish will remain living their entire lives in the lagoon making our region one of the only locations in the world where mature redfish can be caught inshore. 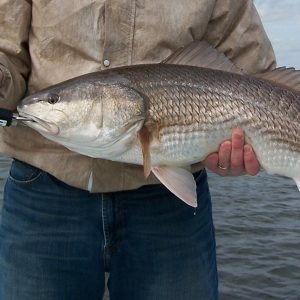 Therefore; in our region we typically target slot size redfish (18 to 27 inches) with ten pound class tackle and the larger redfish with twenty pound class tackle using both artificial lures and bait, depending on the angler’s skill level. Redfish are also targeted in both the inlet passes and open waters of the Atlantic Ocean where they typically form up in spawning schools in the late summer and fall.